You can download this Utility in the Downloads section. 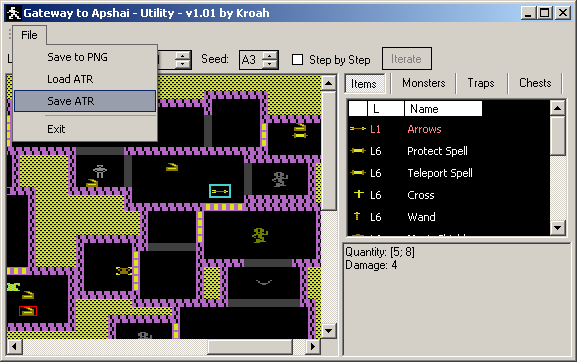 This utility allows you to generate the dungeon maps of the game 'Gateway to Apshai'. It's based on a disassembled dump of the Atari PAL version (50Hz). The ATR file used is included in the archive (CRC32 0xD60949B2). The generation can be done step-by-step by clicking on the corresponding checkbox 'Step by Step' and iterating with the button 'Iterate'. The checkbox can be unchecked to stop the step-by-step mode. The map can be saved at any moment to a PNG picture. Items, monsters, traps and chests can be clicked on the map (or on the list at the right) and some informations will appear in the bottom right panel. 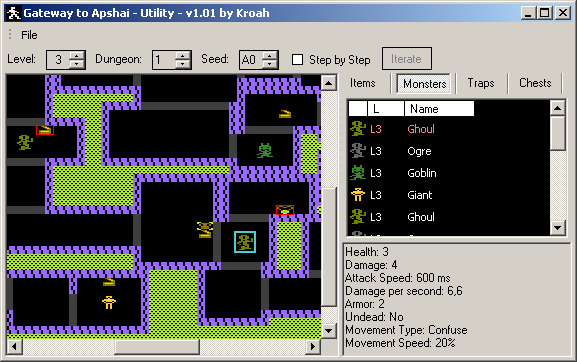 The game is split in 8 levels (beginning at level 1) and at each level, the player is asked to choose among 16 dungeons. Each dungeon has its own seed stored in a byte. 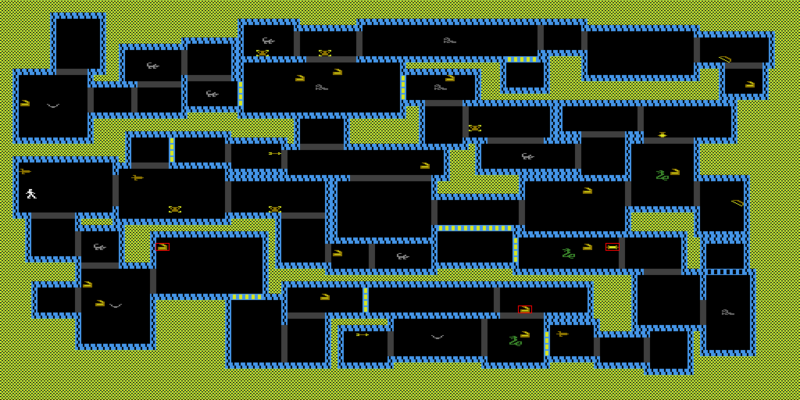 The same seed will produce the same map (items, monsters, traps and chests included) for the same level. The same seed will *not* give the same map for 2 different level. A working ATR image of the game can be saved with the modified seeds (no need of the original game) and can be later reloaded. 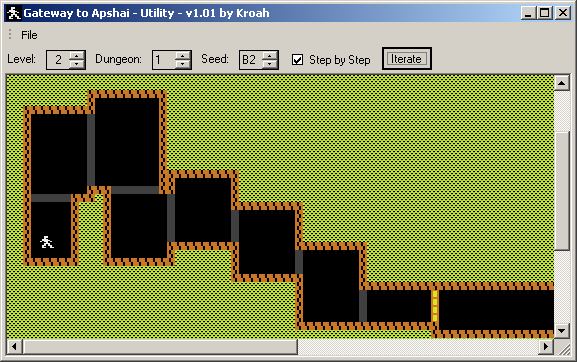 Some seeds can't produce a valid map and will hang the game if they are chosen (a dialog box will pop up to warn you). The Dungeon 8 from Level 7 seems bugged, the generation never ends. Both this utility and the game can't produce this map. This bug has been confirmed on a real Atari. This utility is written in C# and needs the Microsoft Framework .NET 2.0. It won't run without it and will crash as soon as you'll launch it. You only need the 'Redistributable Package' not the SDK (Software Development Kit). If you have some questions, want to leave me a word or simply discuss, you can contact me by email or through the forum. Added: The seed of each dungeon can be modified. Added: Load feature which can get the seeds from an existing ATR image of the game. Added: Save feature which can put the seeds to a new working ATR image of the game.